The versatile Casanova saw action on both offense and defense in college, as well as returning kicks, and despite injuries, he received consensus All-American honors as a defensive back in 1970 and ’71. Casanova was chosen by the Bengals in the second round of the 1972 NFL draft and moved directly into the starting lineup at free safety, intercepting five passes while also returning 30 punts for a 9.6-yard average that included a touchdown. He missed five games due to injury in ’73, although still intercepted four passes, but came back to gain a Pro Bowl selection in 1974. Casanova was shifted to strong safety in ’75 and received first-team All-AFC honors from the Associated Press. Bengals went 10-6 to finish second in the AFC Central while leading the conference in interceptions (26). Casanova had another Pro Bowl season in 1977 but, having started medical school while playing football, he retired to complete his degree and go into medicine. 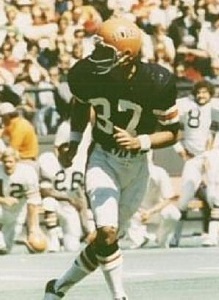 Overall, Casanova started 65 games for the Bengals and intercepted 17 passes, two of which he ran back for touchdowns. He also scored on a fumble recovery. As a punt returner, he averaged 8.6 yards on 91 returns with one TD. He was a consensus first-team All-NFL choice once, received first- or second-team All-AFC recognition after three other seasons, and was chosen to three Pro Bowls. In addition to practicing medicine as an ophthalmologist, Casanova also went on to serve in the Louisiana state senate.